The jewels are just stunning – pearls in abundance, amethysts, jade, beryls, and what could be moonstones amongst others. The back cover is not quite so lavish, but wonderful in its own way. 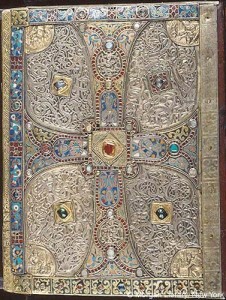 Silver and gold have been worked into interlace, similar to that in the Lindisfarne Gospels, and although the jewels are fewer in number, the enamel work in very fine indeed. The additions of two vertical strips at either side edge indicate the the back cover was not made for this book. 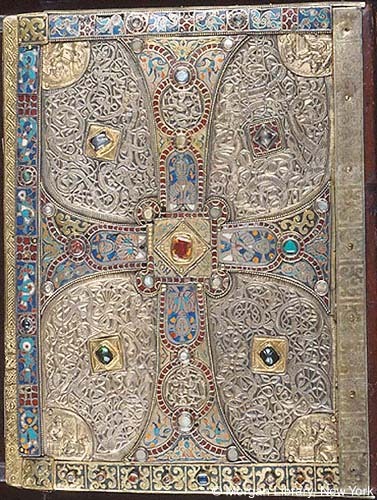 It is thought likely that the book was produced at the Royal Abbey of St Denis just outside Paris. There is a discussion of the book cover in detail here. 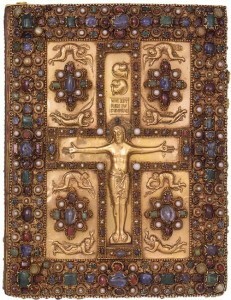 The Codex Aureus of St Emmeram (Golden Book) is also a ninth century book. 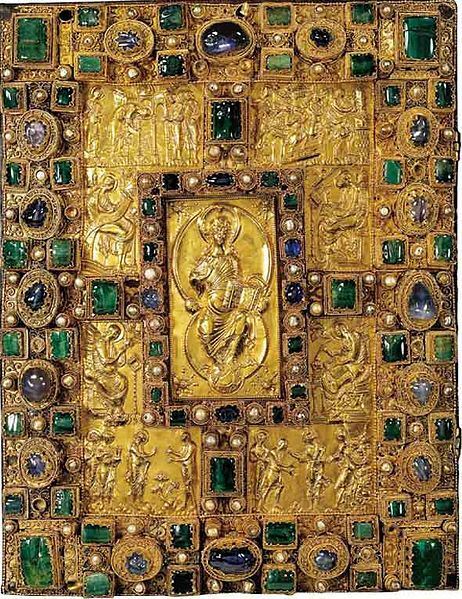 The date for this book is quite precise – 870, and it was produced for the Holy Roman Emperor Charles II (the Bald), at his Palace School, probably again at St Denis. There must have been some exceptionally skilled craftspeople around at that time! It is a large book at 420×300 mm. Again there is a central cross shape, but this time the figure is Christ in Majesty holding a book where the text is clear and reads: ‘I am the way, and the truth…’. Around the central figure are the four evangelists’ symbols, and there are images of Christ’s miracles in the four L-shaped panels. It is thought that the monks Liuthard and Beringer wrote the book and to see some inside pages of their work click here. This is what some jewelled book covers are like now. 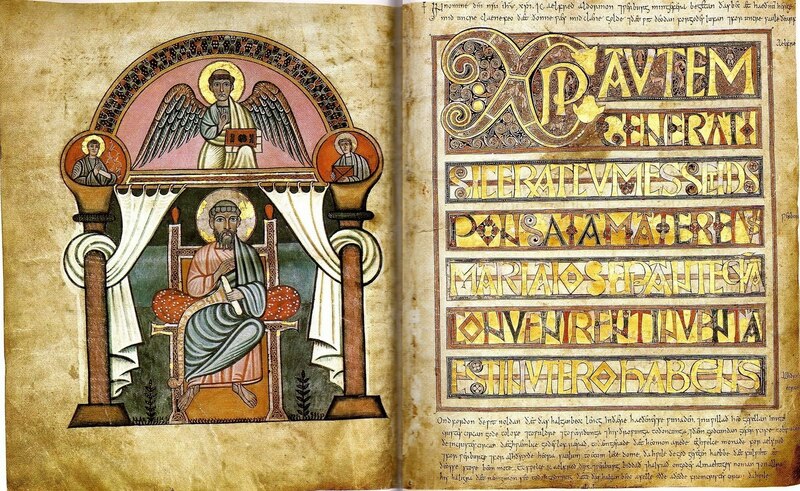 This is the Codex Aureus of Freckenhorst, which is an 11th century gospel book. Although a few mother-of-pearl remains, with some pieces of jade, turquoise and amethyst, most of the stones have been prized out with a knife, which does leave us a peek at the wooden board forming the structure of the cover below. The central ivory is particularly exquisite. 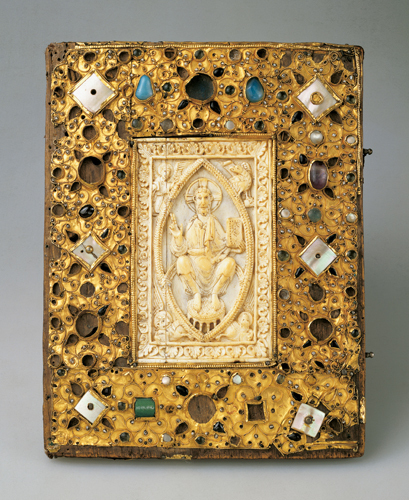 Christ is in a mandorla (this is the shape of two circles overlapping and so is where the circle of heaven overlaps with the circle of earth – which is where Christ is situated), holding a book, which again emphasises the importance of the Word at this time. 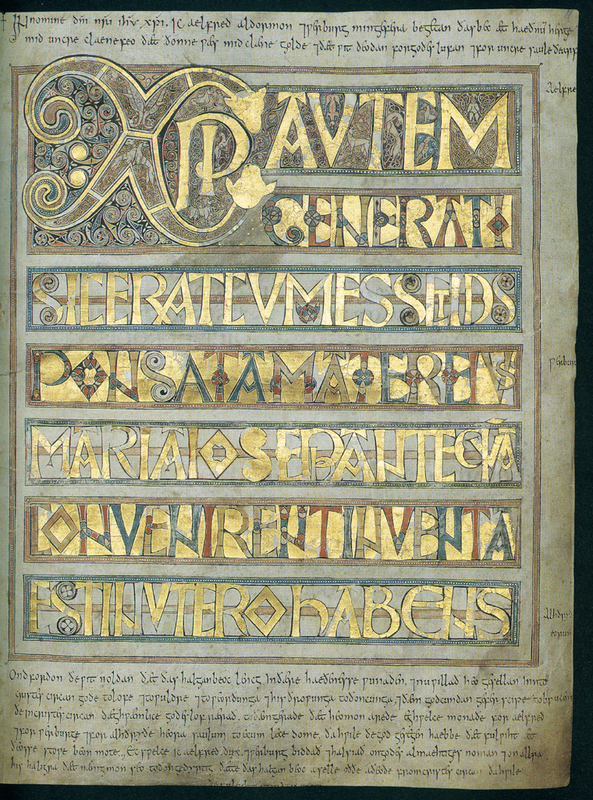 A note at the beginning of the Gospel of St Matthew in the Stockholm Codex Aureus tells us that the book was stolen by the Vikings, no doubt for its precious cover, but was bought back ‘with much gold’ and presented to the church. It is quite likely that when it was realised that this was a book not a box, the cover was ripped off and the Vikings were then quite happy to sell the inside of the book on. You can just about make out the note written above the magnificent ‘Christi Autem’ and then continued at the bottom of the page. It explains that Earl Alfred, from Surrey, and his wife Werburg bought the book from the ‘heathen invading army’. 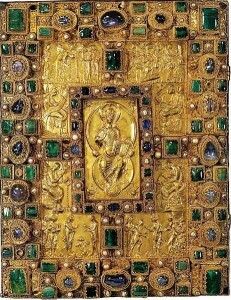 The inside lives up to its name of Codex Aureus. 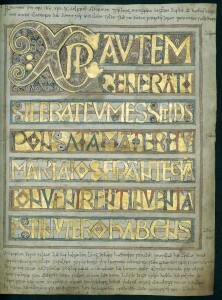 A mid-eighth century book, it was probably produced in Canterbury. 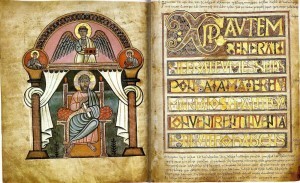 Pages of dyed purple vellum with gold, silver and white pigments are followed by undyed skin with black, red and gold. Wulfhelm the goldsmith is named, so too are Ceolhard , Niclas and Ealhhun, who were probably the scribes and illuminators. This entry was posted in Blog, Manuscripts and tagged book binding, books, Codex Aureus of Freckenhorst, Codex Aureus of St Emmeram, jewelled cover, Lindau Gospels, Stockholm Codex Aureus, vellum on 4 December 2013 by Patricia.